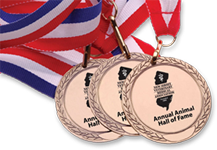 The New Jersey Veterinary Medical Association Animal Hall of Fame Committee has selected three dogs, one cat and a team of various species for induction into the 22nd Annual NJVMA Animal Hall of Fame. A retired Red Cross service dog, a tranquil feline companion, a devoted family member, a group of various pets for education and a gleeful ball collector will be honored on March 12th with induction into the NJVMA Animal Hall of Fame. HUDSON: Hudson is a seven year old yellow Labrador Retriever. Hudson is a retired Red Cross Disaster Response Therapy dog and has had an amazing career comforting families displaced by natural disasters and veterans returning from combat. Hudson was nominated by Gene Boyle and Dr. Jennifer Feeney of Somerset Veterinary Group in Bridgewater, Somerset County. LUKE: Luke, a seven year old Domestic Shorthair cat, is a laid-back, nurturing member of the Comparetto family who can be found doting on his sister-cat Gizmo and his handler, Laura. Luke was nominated by Laura Comparetto and Dr. Nancy Gruber of Murray Hill Veterinary Associates in New Providence, Union County. MATTHEW: Matthew is an eleven year old German Shephard/Chow mix. Starting life as a Hurricane Katrina rescue, Matthew was adopted into the loving home of Sean and Karen and was there to welcome the arrival of their daughter, Elizabeth. Elizabeth was diagnosed with leukemia at the age of two and shortly after, Matthew was diagnosed with cancer. Matthew and Elizabeth's strong bond endured through both of their treatments and they are both healthy today. Matthew was nominated by Sean Macmillan & Karen Poskonka and Jennifer Cruz & Dr. Seth Glasser of Animal Emergency and Referral Associates in Fairfield, Essex County. RBVH EMPLOYEE PETS FOR EDUCATION: As honorary staff members, these 31 pets are an essential part of the RBVH team. Employees volunteer their pets to participate with training programs so that students and new veterinary team members can gain the invaluable hands-on training with live animals for student programs and new employee orientation. The group consists of a variety of breeds, temperaments, and species to help provide a well-rounded training experience. The group was nominated by Dr. Melanie Hunt of Red Bank Veterinary Hospital in Tinton Falls, Monmouth County. SIMON: Despite struggling with his weight which resulted in significant orthopedic issues, Simon, an eight year old Golden Retriever, is perpetually motivated to collect all sorts of baseballs, softballs and tennis balls during his walks around the neighborhood. His owners collect his 'retrievals' and these are ultimately donated to charity. Simon was nominated by the Digironimo family and Dr. Warren Briggs of Ocean County Veterinary Hospital in Lakewood, Ocean County. The luncheon honoring this year's inductees will be held noon March 12 at the Wyndham Hamilton Park Hotel & Conference Center in Florham Park. The event is open to the public and ticket information is available on the Hall of Fame website: www.njvma.org/animal-hall-of-fame/.